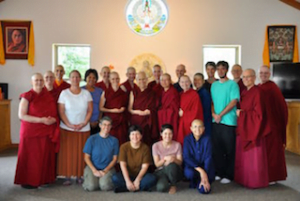 We’ve had a wealth of Dharma teachings this August, with back-to-back retreats on monastic life and emptiness. This is the heart of why Sravasti Abbey exists, to provide a space for practitioners to hear, think, and meditate on the Buddha’s teachings and keep them flourishing in our hearts and in the world. See photos of the steady stream of Dharma activities here. We had a lovely group for Exploring Monastic Life this year with four Abbey monastics, three anagarikas, and nine guests. The other Abbey monastics attended the teachings but didn’t join the discussion group due to size constraints. 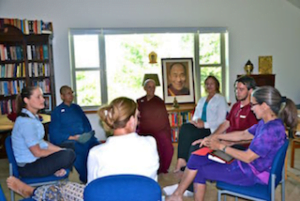 There was a lot of laughter and there were serious moments as well, as each person explored his or her monastic aspirations and compared them with their worldly aspirations. We supported each other as we delved deeply into our views, aspirations, and habitual emotions to gain clarity on the role that the Dharma plays in our lives. 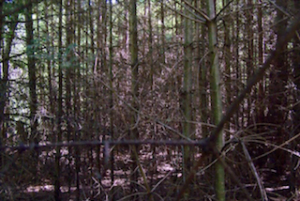 We also helped each other as we worked in the forest, thinning trees to restore forest health. Each year we see that some EMLers, identified as city slickers, discover their inner forester as they spend more time outdoors in the meadows, gardens, and forest at the Abbey. Midway through the course, we enjoyed a short visit from Catholic nun Sister Mary Ann Farley, whose talk on the joys and challenges of decades of ordained life had us in stitches—watch it here. View teachings by Ven. 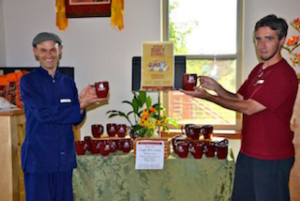 Chodron and short talks by Abbey monastics here and check out photos here. Ask yourself, “What’s the state of my mind? Ven. Chodron began by talking about the difference between secular mindfulness as used in psychology and medical practice to alleviate chronic pain, versus Buddhist mindfulness that is geared toward liberation and full awakening. She then discussed the two complementary mental factors of mindfulness and introspective awareness and how to use them in all situations to protect our mind from afflictions and to accomplish others’ good. She emphasized that all of us have many opportunities each day to engage in small and large actions of kindness for others. When we do so, we feel better about ourselves and more connected to others in a healthy way. Watch or listen to the talk here. Geshe Yeshe Thabkhe has been to the Abbey twice before, each time teaching four chapters from the profound treatise, The Four Hundred, written by Nagarjuna’s heart disciple, Aryadeva. He was scheduled to come to the Abbey again in August to teach the next four chapters, but due to health problems, his doctor advised him not to travel at this time. 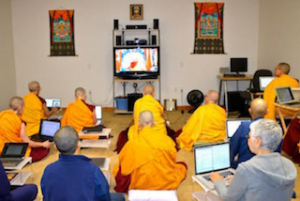 But never flagging in his compassion to benefit living beings, Geshe-la gave us the teachings via UStream in the same number and duration of sessions that he would have had he been here. This was facilitated by our dear friends Joshua and Diana Cutler from the Tibetan Buddhist Learning Center in New Jersey, with Joshua doing a wonderful translation from Tibetan into English. Everything went smoothly—watch the teachings here. Our expression of appreciation to Geshe Thabkhe on video is here. Geshe-la taught the part of the next that refuted permanent functioning phenomena, misconceptions of the self, truly existent time, and other wrong views. Drenching our minds in these wisdom topics—four hours of teaching daily, plus a Q&A session done by Ven. 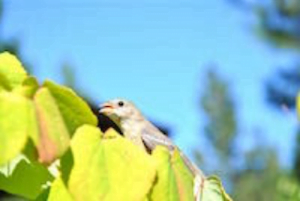 Chodron, and two meditation sessions—had a deep influence, the long-term results of which are yet to be seen. We are extremely grateful to Geshe-la as well as to Josh and Diana for their kindness, as we now turn to contemplating and meditating on what we learned. Kuni and her family’s campaign to raise funds for a new, road-worthy Abbey-mobile for our growing community continues. We’re very appreciative to all of you who have made offerings for a new vehicle. For those of you who asked for them, mugs were shipped this past week. You should have them soon. If you didn’t ask and want one, Please let us know. We’re over halfway there in terms of funds, but many mugs remain, so please consider sipping your morning tea or coffee from one of them. Making an offering for one of these Abbey mugs will contribute to safe transportation for our monastics. Read Kuni’s letter and support the project here. Ven. 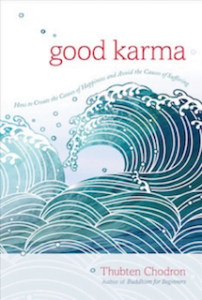 Chodron’s newest book, Good Karma: How to Create the Causes for Happiness and Avoid the Causes of Suffering was released in major bookstores on August 9. A contemporary commentary on the thought-training text The Wheel of Sharp Weapons, the book was featured on the New Paperback table in Barnes and Noble bookstores. It’s now available from Shambhala Publications, Amazon, major bookstores, and at the Abbey. Spokanites! Don’t miss Ven. Chodron’s book reading at Auntie’s Bookstore on September 28 at 7 pm! Watch Ven. Chodron tell her personal story of how the book came to be. September and October bring the final Offering Service Saturdays in 2016. September 17 is the next one. See the photos from our wonderful event on the last day of July. We’ve added an extra day—September 24—for a special project: clearing up the path on Milarepa’s Mile. As the name might suggest, Milarepa’s Mile is a steep, dense thicket about three-quarters of a mile into the Abbey property. We’ll have an all-day work party—including a potluck picnic—for hardy volunteers who love to work in the forest. The goal is to clear the path to make way for future thinning to help this gorgeous patch of the forest to thrive. We provide loppers and handsaws. You bring your joyous effort! The final Offering Service Saturday of the year is October 8. If you’re in the neighborhood, please join us. These are lots of fun and help immeasurably. Youth Emergency Services of Pend Oreille County, a local non-profit organization that Vens. Chodron and Jigme participate in as board members, is seeking to fill two positions—click on the links for job descriptions for the Program Director and Case Worker. Ven. Chodron is a contributor to A Matter of Life and Death edited by Rosalind Bradley, a book of reflections on the meaning of life and death from the perspectives of various religions, cultures, and countries. Ven. Chodron’s guided meditations and short talks are now available on the Insight Timer app for phones and tablets. Visit their website for download information. Read Ken’s new piece on dropping our attachment, Hot Potato. 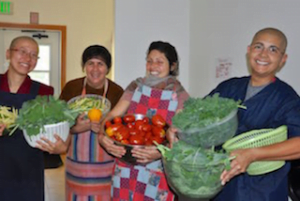 Cynthia and Alejandra from Mexico have stayed on after Exploring Monastic Life and continue to share in our Dharma joy!